Drifting off in thoughts of rising ocean bubbles and the sensation of thinning air, Zader, the main character of Lehua Parker's Hawaiian fantasy novel One Boy, No Water, is brought back to reality by his Uncle Kahana's hand on his shoulder and a warning reminder that he needs to make sure he eats every two or three hours. Uncle Kahana asks Zader if he wants potato-mac or tossed salad and scribbles a note for "Hari's Special" from the shop below his home. He gives the paper to his uber smart dog 'Ilima and she heads downstairs to place the order. After a brief conversation about how to protect yourself from potentially man-eating sharks, sharks that can discern and reason, 'Ilima returns carrying a plastic bag with Zader's meal. 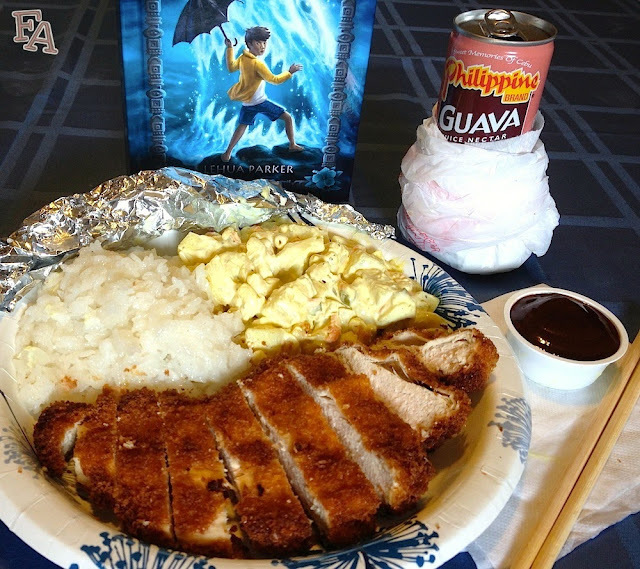 When Zader peels back the foil on the loaded paper plate he finds golden chicken katsu with dipping sauce, sticky white rice, and creamy potato-mac salad. To drink, Uncle Kahana gives him a cold can of guava juice wrapped in a paper towel and plastic bag so the condensation doesn't touch Zader's skin. Just from looking at the plate Zader doesn't think he can finish it, but once he takes the first bite he devours it all like he hasn't eaten in a week. ☂ Heat the oil in a large pan on medium heat. 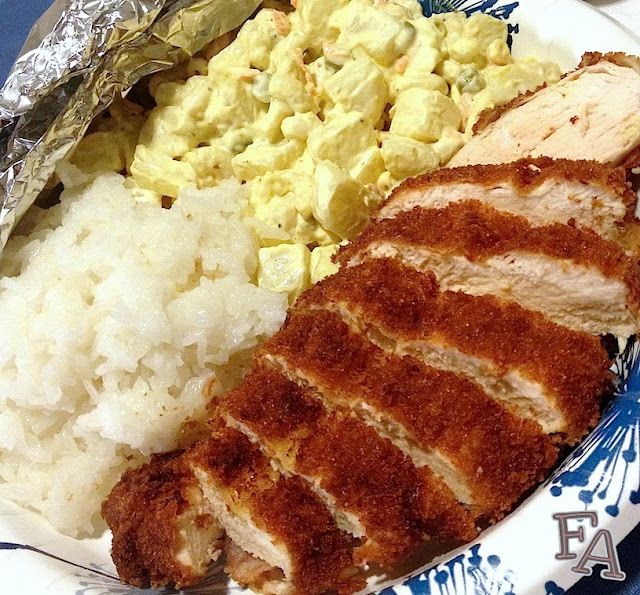 ☂ Place the flour and panko crumbs on separate plates near the chicken & the bowl with the beaten egg. ☂ Dredge a chicken breast in flour. ☂ Then dip it in egg. ☂ Coat it all over in panko. 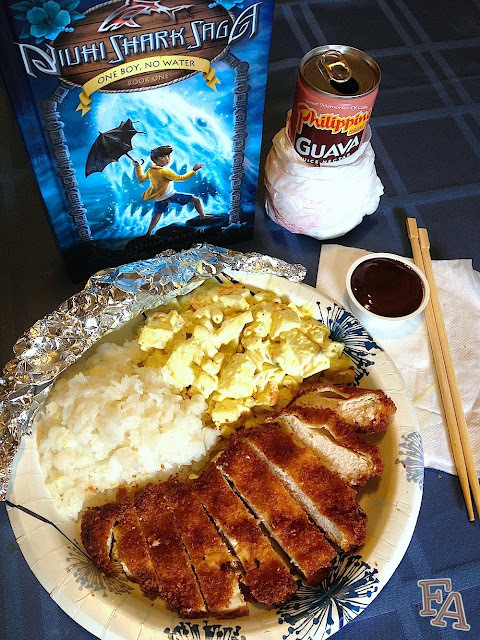 ☂ Have a plate with a paper towel ready for the finished chicken katsu pieces. ☂ Before you cut it, let the chicken cool a little until you are ready to serve. ☂ Place a chicken piece each on your serving plates & cut into horizontal or diagonal strips. ☂ Squeeze a little lemon juice over the chicken if desired. *you'll know when the oil is ready when a tiny flick of water into the pan sizzles instantly. ♥test for done-ness by cutting a small slit in the fatter part of the chicken breast & checking to see if the meat is cooked all the way through. ✭metal tongs are great for this. ☂ Whisk together mustard, garlic powder, ginger, & 2 tsp. water in a bowl until smooth. ☂ Add ketchup, Worcestershire, soy sauce, & sugar & whisk until smooth. 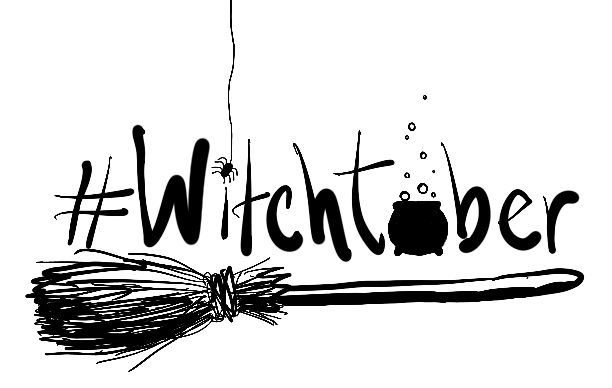 ☂ Hard boil the eggs, cool, peel, and dice. ☂ Peel the potatoes & cut into bite-size pieces & then boil in salted water until tender. Drain & let cool. ☂ Cook the elbow noodles in lightly salted water until tender, but not too soft. Drain & let cool. ☂ Combine the eggs, potatoes, & noodles in a large bowl. ☂ Add the drained can of peas. ☂ Using a cheese grater, grate the two carrots and add the shavings to the large bowl with the other ingredients. ☂ Dice the sweet onion and add to the other ingredients. 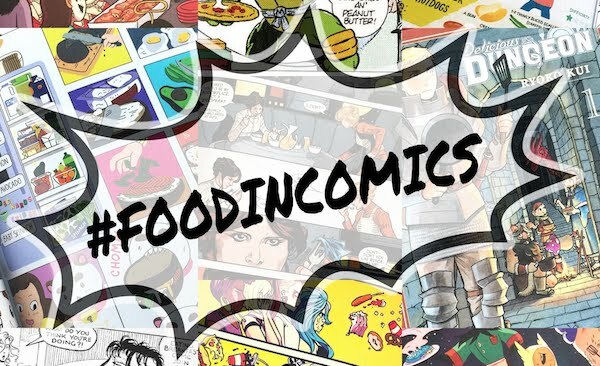 ☂ In a separate bowl combine the mayonnaise and vinegar with a whisk. ☂ Add the curry powder, as well as the salt & pepper to taste. 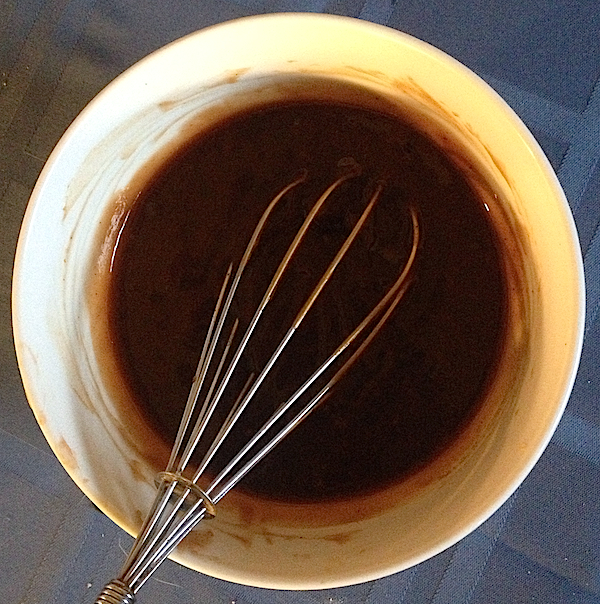 ☂ Whisk the mixture until completely combined & smooth. ☂ Pour the mayonnaise mixture into the large bowl of other ingredients and toss until fully coated. ☂ Cover the bowl and place it in the fridge overnight. 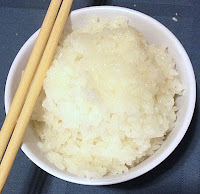 ☂ Prepare the rice in a rice cooker or on the stove top--however you normally do it--but make sure you use long-grain sticky rice, sweet rice, or glutinous rice & soak it in water for at least 30 minutes before cooking. Add 1/2 tsp. salt, too. For sticky rice tips, click here. Serve this meal with a cold can of guava juice and you're all set!